Multi-channel marketing in real estate is more than just using multiple techniques to generate leads. When done well, it can be a referral generating machine that grows your business better than your competition, year after year. So for the real estate business, what is multi-channel marketing, what makes it special for real estate, and how to get the best results from it? All clients are not the same, and as such, how you need to connect with them is going to be different. What works really well for connecting with some types of clients, may be completely ignored by other clients. A lot has been written about the growing impact of millennials in the real estate market and how to connect with them, but even within non-millennials, technology is changing the how, when, and where they want to be engaged. So the more channels you have working for you, the wider the net you can cast for generating business. Each can appeal to different types of clients and prospects, and for some, they can even appreciate connecting with you through more than one channel. So beyond just casting a wider net, having more channels can also allow better engagement with different clients. And although the channels may be different, the goal in real estate is the same: generating leads through referrals (and repeat business), by getting and staying top-of-mind. According to Cindy Marlowe, owner of Redhead Properties in Denver, "Real estate is not a transactional business . . . one sale, one purchase, and you’re done. Rather, it's a business of building relationships and networks of people that trust you and support you in your business efforts. Which is why referrals from clients are so important." But the challenge of getting referrals in real estate is, of course, staying top-of-mind when the average homeowner only needs your service once every 11 to 15 years (according to an analysis by Paul Emrath, Ph.D., Economics and Housing Policy for the National Association of Home Builders). 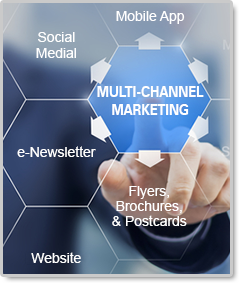 So where does multi-channel marketing fit with this? In real estate, effectively using multi-channel marketing for creating high-value referrals and staying top-of-mind involves the three C's: contact, content, and cost. 1) ON-GOING CONTACT. Despite the differences of each channel, one thing they have in common is that to be successful, they each need to focus on creating on-going contact with the segment of your sphere of influence that they are connecting with. 2) VALUABLE, PERSONALIZED CONTENT. To maintain this on-going contact, each channel needs to be providing something of value to the client. There is a name for increasing interactions with clients that they do not find valuable . . . it is called spam. From our experience at APPLICA Solutions, what makes content the most valuable is personalization. We conducted a user survey and 9 out of 10 said they would recommend our interactive eNewsletter to a friend, and when we dug deeper, the number one reason given was that it was personalized for their particular home and goals. 3) COST-EFFECTIVENESS. Adding more marketing channels can directionally add more cost in terms of both dollars and time. However, the good news is that new marketing automation technologies are enabling low-cost, easy to manage multi-channel marketing solutions that can delivery on-going, personalized content to your clients for you. So managed appropriately, multi-channel marketing can be the key to you generating an on-going stream of referrals that enable you to outperform your competition and grow your business year over year.